Business Succession Planning Training Material is designed for developing and maintaining a succession plan. Teach your supervisors how to confidently design a succession plan, defining roles, responsibilities and functions, forecasting needs and more! Seeing is Believing This sample manual to teach Business Succession Planning is in MS Word format. Succession planning for corporations and small businesses requires more than simply having a plan in place. It’s about developing leaders, and knowing how to develop a succession plan that supports an organization throughout its entire process. With a full day of rich content on the value of succession planning, its key elements, and the opportunity for students to create their own effective business continuity plan unique to their own business’ needs. 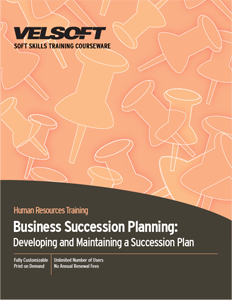 Velsoft's Business Succession Planning Training Materials provide everything necessary for trainers who want to give their students the best business success training. All of Velsoft’s training material is completely customizable for instructors, and includes an instructor’s guide, student manual, course activities, and more! Trainers also have the opportunity to combine their training material with eLearning, Velsoft’s web-based blended learning solution that combines mobile learning with classroom-led training.